The calendar says it's Fall, but temperatures in Texas continue to hover around 90 degrees! I asked my good friend and Pilates client, holistic skin care expert Pam Crawford, to share some skin care knowledge with us for these "late Summer" months. Mix equal parts finely ground sea salt (Himalayan Pink Salt is my fave due to it's high mineral content for nutrition and detoxification) with a high quality oil. Coconut oil is soothing and rich for dry skin, while Grapeseed oil is lightweight and better suited for oil skin types. Massage the mixture into your skin for a minute or so, using gentle circular movements. Rinse with warm water and continue to work the oil into your skin until it has absorbed. If you feel a bit oily, simply wash your face with your favorite gentle cleanser. Your skin will feel fresh and full of moisture. Stay tuned for a luxurious, skin-hydrating recipe from Pam in November. In the meantime, learn more about Pam here. I have always been drawn to the Hamsa Hand. So much so that I have a Hamsa tattooed on my left arm! The Hamsa is a beautiful representation, in that no matter what religion or faith you identify with, it is a universal symbol reminding us of unity, connection and that we are all one. The hand, especially the open right hand, is a sign of protection that also represents blessings, power and strength. Used to protect against evil eye, a malicious stare believed to be able to cause illness, death or general unluckiness, Hamsas often contain an eye symbol. The eye in the Hamsa represents the eye that sees everything. The Hamsa brings its owner happiness, luck, health and good fortune. The Hamsa hand has a variety of different meanings depending upon the culture. The word "hamsa" derives it's name from the five fingers on the hand. In Hebrew the number five is "hamsesh". For Hindus and Buddhists, it symbolizes the interplay of the chakras, the energy flow in the body, the five senses, and the mudras that effect them. These energies can be combined to change the flow of energy in the body and heal psychological and physical ailments. Just like our Yoga practice can draw from various cultures and thought, the Hamsa is a symbol that is a significant universal image in various religions; Judaism, Christianity, Hinduism, and Buddhism. And, just like our Spiritual practice on and off the mat, the Hamsa reminds us that we are all connected and that we are all one. As the days seem to get longer and longer, and the sun stronger and stronger, it is a sure sign that we are moving into Pitta season. Made up of the primal elements fire (mainly) and water (secondarily), pitta has hot, oily, sharp, light, sour, fluid, and pungent attributes—many of the same sensory qualities that summer surrounds us with. As we enter the summer season, the other elements of earth, air and ether take a backseat to fire for many of us who have higher amounts of Pitta in our constitutions. If you or others you know are predominantly Pitta, you may notice that you tend to be a bit more fiery than usual. Signs of Pitta imbalance this can be represented in the physical body through acne, heartburn, skin irritations, diarrhea and more. Through the mind, it can be witnessed through irritability (especially after being exposed to heat), hypercritical of self or others, competitiveness, envy, and being easily angered. What does this mean for you? 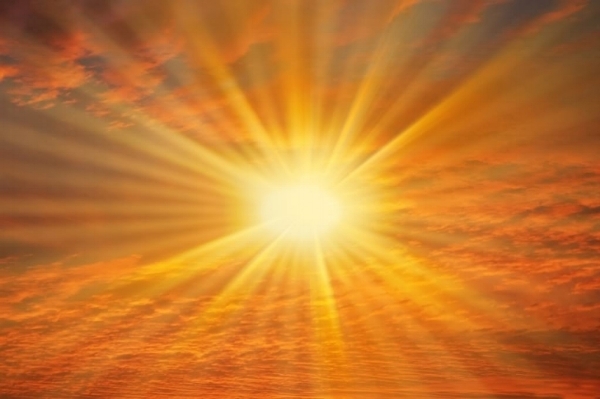 Well, if you are a hot yoga loving Pitta-Yogi, then maybe during these summer months you should focus more on non-heated classes, as you have enough fire and heat in your body to warm yourself quickly than those of a Vata or Kapha nature. Pitta governs digestion and metabolism, so the fire may flare first in the small intestine and the stomach—Pitta’s main seats in the body—with excesses of digestive acid and bile. Fresh, seasonal fruits and vegetables, especially those with a high water content, can help you to cool down. Also taking sips of aloe vera juice or lots of coconut water throughout the day. However, it’s best to avoid icy-cold drinks (especially with meals) as they will douse your digestive fire and cause digestion to slow down. It’s also important for Pittas to eat three meals a day during this season, and lunch should be eaten as close to noon as possible. If you need to go out into the sun, be sure not to do it on an empty stomach. My Farmer's Market Gazpacho is a perfect Summer recipe to balance the fiery-side of Pitta. Even better than store-bought versions. I suggest keeping these in the fridge or freezer for the best texture. The chocolate coating gets all snappy which is a wonderful contrast to the creamy middle. 1. Place cashews in a bowl and cover with water. Let soak overnight, or for at least 2-3 hours. If your blender isn't great at blending things smooth, I suggest soaking overnight for the best results. 2. Drain and rinse the cashews after soaking. 3. Add the cashews, melted coconut oil, agave, milk, and peppermint extract into a high-speed blender. Blend on the highest speed until completely smooth. This can take a couple minutes. 4. Line a baking sheet with parchment paper and grab mini cupcake/candy liners. Add a half tablespoon of filling into each liner. Place on the baking sheet. Repeat until you don't have any filling left (you should get about 22-25). Freeze, uncovered, for 20-35 minutes, or until firm to the touch. 5. After freezing, quickly pop the patties out of the cupcake liners and set each on top of their respective liner. Return to the freezer for 10 minutes to firm up even more. 6. Meanwhile, melt the chocolate and coconut oil in a small pot over the lowest heat. When half of the chips have melted, remove it from the heat and stir until all the chips are melted. Allow the chocolate to cool slightly for a few minutes before dunking the patties. 7. Remove the patties from the freezer and dunk them into the melted chocolate with a fork. Tap the side to shake off excess chocolate and place on parchment paper. Do this step as quickly as possible so the patties don't melt. Update: Some of you are having trouble with the chocolate thickening up as you do this step. If this happens, I suggest heating the chocolate again over low heat to thin it back out. 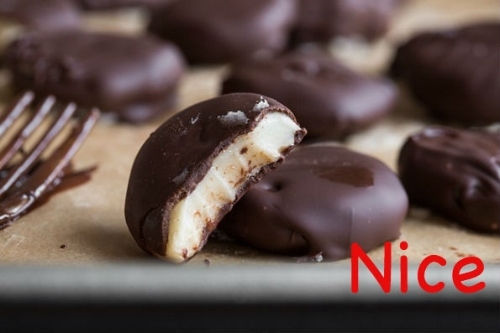 The cold peppermint patties are probably causing it to thicken with time. Another option is to just drizzle the chocolate on top of the patties. 8. Return the patties to the freezer until set, for about 10 minutes, until the chocolate coating is firm. Store leftover patties in the freezer/fridge until ready to enjoy! 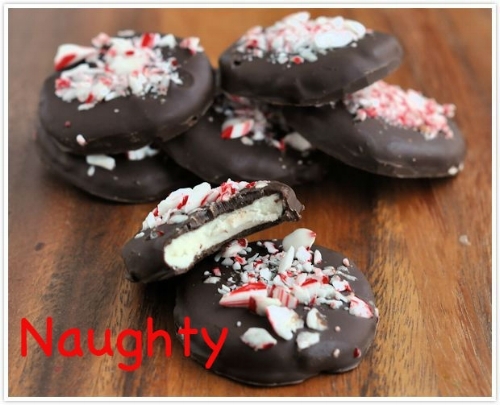 * To be extra festive (and a little naughty) sprinkle crushed candy canes on top of the chocolate before the last step. Thanks to Oh She Glows for the healthy, but tasty twist, on a classic! I'm always playing around with power bar recipes. And when I'm on the go, which is often, I want to grab something that is packed with nutrition and not too sweet. These bars are my new go to afternoon snack. Recipe adapted from Going Against The Grain by Diane Smith. Your muscles aren't just fibers and nerves. They're complex tissues that help you move and, in the process, torch calories and fat to give you a lean, fit figure. So do yourself a favor and get to know them—they're a lot more interesting than you might think. 1. Your muscles can be up to 70 percent water. So when you work out, you should always carry some H2O with you to keep them hydrated. 2. Muscle tissue makes up 35-40 percent of your body weight. Keep this mind before jumping to conclusions when you hop on the scale. 4. Using heavier weights in your exercises won't necessarily make your muscles stronger. In order to make strength gains, practicing good form should be at the top of your get-fit list. 5. While you can't target weight loss, you can spot tone certain muscles. Just do workouts that are specific toward the body part you want to work on (shoulders, abs, legs), to start seeing more results. 6. A single step uses almost 200 different muscles, including your hamstrings, quads, iliacus, and psoas major and minor. 7. Your muscles memorize movement patterns. It's important to change up your routine every 6 weeks to 'confuse' your muscles and keep seeing gains. But, if you end up taking a break from the gym—planned or unplanned—all your body needs is a few warm-up exercises to remember how to get into the swing of things. At first glance, Pilates and Spinning don’t appear to have much in common – doing 100’s on the Reformer is a world away from sprinting on a stationary bike. However, as a devoted Pilates student + trainer and Spin instructor, I’ve noticed how my Pilates training has improved my performance on the bike. Pilates builds a deep awareness of our muscles and breathing – it can act like a biofeedback loop that can have big results and impact. 1. Stability, form, and balance. 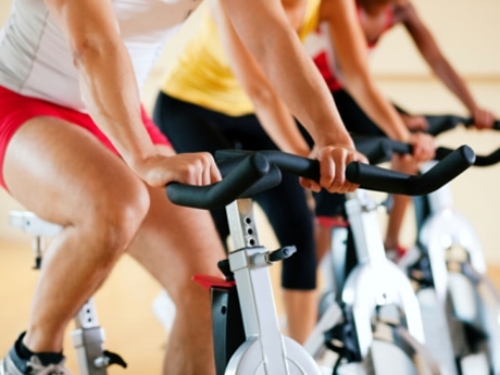 Pilates builds a strong core, which improves posture and form on the bike. Strong abdominals anchor your body to the bike seat to power your legs and prevent locking out the arms. When standing on the pedals (or “out of the saddle”), the core muscles (especially the hip stabilizers) preserve good form and maximize the workout by preventing swaying from side to side and leaning too heavily on the handlebars. 2. Better breathing. When the flywheel is heavy and you’re pushed to your max, it’s really easy to let your upper body slouch and rib cage collapse. But this inhibits breathing – obviously not good! Pilates training helps strengthen the upper back and teach back extension, enabling you to keep the chest open, shoulders back, and increases awareness of the lungs inhaling and exhaling so that enough oxygen keeps flowing to the muscles during the hardest part of the workout. 3. Stronger legs. Pilates lower body exercises – bridges, leg lifts, side kicks, and lunge series – work together to build long and lean quadriceps and hamstrings, the most used muscles in Spinning. Strong leg muscles power the sprints and climbs that are part of every Spinning class, and solid quads and hamstrings help to protect your knee joints, too. Side Note: It's important to mix in both Cardio and Strength Training (yes, Pilates counts!) in your weekly routine to get strong and lean. There are 6 essential principles in Pilates that are important to keep in mind as you begin your Pilates journey or dive deeper into your practice. 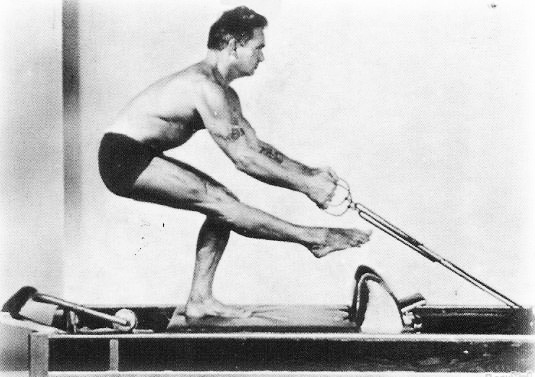 These principles were not created by Joseph Pilates himself, rather they were brought about by those who studied under him in an effort to preserve and spread his unique method of exercise. This addresses the key component in Pilates that everything begins and ends with the center. Some people call this the core, others call it the “powerhouse.” All Pilates exercises are energized and powered from the center (you can read more about what “the core” includes in this post). Pilates is not an exercise method where you can show up and zone out. One should bring their full attention to each exercise and what is going on in the body to work efficiently, effectively and with intention. Every Pilates exercise is to be performed with full body control. Using momentum or rushing through exercises at the expense of form and function is not Pilates. Pilates requires control of both mind and body. Exercises should be performed with precision and focus. The details matter. Working with precision will affect the muscles that you work and the effectiveness with which you work them. Failing to focus on the precise details will reduce the effectiveness of the method. This is the beauty of Pilates. This is why we only have you do 8-16 repetitions rather than 30+. When done right, more is not better. In Pilates we work smarter, not harder. Joseph Pilates encouraged full, intentional breathing in life and in exercise. The breath has the power to transform the body and mind. When practicing Pilates one should exercise the lungs by breathing deeply and synchronizing the breath with the movement at hand. Pilates exercises should flow with grace and ease. Flowing through each exercise, from one exercise to the next and using all part of the body in graceful unison. First make your crust. 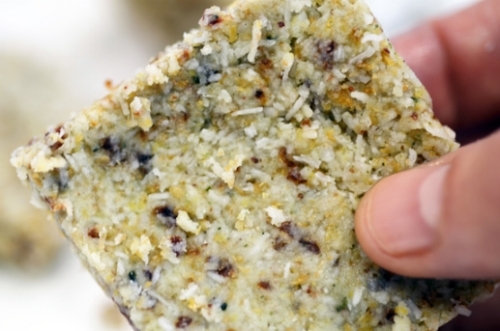 Add all ingredients for the crust to a food processor. Put crust ingredients in an bread pan, press down until evenly distributed. Now heat up a small saucepan under medium heat. Add your blackberries and blueberries, along with your maple syrup.Be sure to continuously stir so the mixture doesn’t stick to the bottom or burn. Once you have almost a runny jam, add your melted/softened coconut cream concentrate along with cinnamon and salt. When all ingredients are incorporated, pour mixture on top of crust and press flat. Put in the fridge to harden for 30-45 minutes. Water is a wonderful performance enhancer. Unfortunately, too many athletes overlook the power of this essential nutrient. Perhaps it's your turn to give water a try? This article offers droplets of information to enhance your water I.Q., optimize your water balance, and help you feel and perform better. 1. You don't have to drink plain water to hydrate. Oatmeal is 84 percent water. Low-fat milk is 90 percent water. Coffee is 99.5 percent water. Lettuce is 96 percent water. Tomato is 95 percent water. Broccoli is 89 percent water. Low-fat vanilla yogurt is 79 percent water. Ice cream is 60 percent water. 2. You cannot function without water. Your body cannot survive without sufficient water, as noted by the fact that athletes die from dehydration. Water is the solvent for your biochemical reactions. 3. You need water for digestion. Water is required to moisten food (saliva), digest food(gastric secretions), transport nutrients to and from cells (blood), discard waste (urine), and dissipate heat (sweat). Water is a major component of the muscles and organs; about 60 percent of a male's body weight and 50 percent of a woman's body weight is water. 4. Your body parts have different water contents. Blood is approximately 93 percent water. Muscle is about 73 percent water. Body fat is about 10 percent water. 5. Bioelectrical impedance (BIA) methods of measuring body fat actually measure body water. This formula estimates the ratio of water to muscle and fat. Hence, if you use a Tanita Scale or Omron device, be sure to maintain adequate hydration. If you are dehydrated, you'll end up with an inaccurate (higher) estimate of body fat. 6. Your body produces 8 to 16 oz. of water per day. This occurs during normal metabolic processes. During a marathon, a runner's muscles can produce that much water over two to three hours. When muscles burn glycogen, they simultaneously release about 2.5 units water for every 1 unit of muscle glycogen; this helps protect against dehydration. 7. Your coffee is a source of water. Although once thought to have a diuretic effect, current research indicates coffee (in amounts normally consumed) hydrates as well as water over a 24-hour period. That is, after drinking coffee, you may urinate sooner, but you will not urinate more than you consume. Army research on caffeine and dehydration confirms coffee is an acceptable source of fluids for athletes, even during exercise in the heat. Hence, coffee and other caffeinated beverages such as tea or cola count towards your water intake. 8. An increased concentration of particles in your blood triggers the sensation of thirst. If you are a 150-pound athlete, you'll start to feel thirsty once you've lost about 1.5 to 3 pounds of sweat (1 percent to 2 percent of your body weight). You are seriously dehydrated when you have lost 5 percent of your body weight. 9. Body water absorbs heat from your muscles and sweat dissipates heat. The evaporation of 1 liter (about 36 oz.) of sweat from the skin represents a loss of about 580 calories. Sweat keeps you from overheating during exercise and in hot environments. 10. You can measure your water losses after a workout. To determine how much water you lose when you sweat, weigh yourself (with little or no clothing) before and after one hour of hard exercise with no fluid intake. The change in body weight reflects sweat loss. A one-pound drop in weight equates to loss of 16 oz. of sweat. A two-pound drop equates to 32 oz.—that's 1 quart. Drink accordingly during your workouts to prevent that loss. 11. When you sweat, you lose water from both inside and outside your cells. The water outside the cells is rich in sodium, an electrolyte that works in balance with potassium. Potassium is an electrolyte inside the cells. Sweat contains about seven times more sodium than potassium, hence sodium is the most important electrolyte to replace during extended exercise. 12. 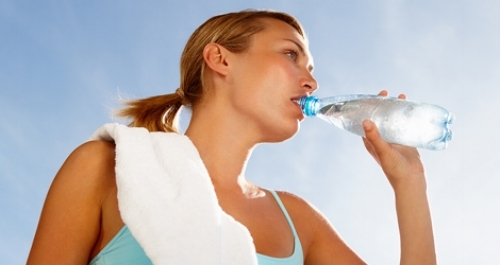 Dehydration can hinder athletic performance. Athletes who lose more than 2 percent of their body weight (3 pounds for a 150-pound athlete) lose both their mental edge and their ability to perform optimally in hot weather. Yet, during cold weather, you are less likely to experience reduced performance, even at 3 percent dehydration. Three to 5 percent dehydration does not seem to affect muscle strength or performance during short intense bouts of anaerobic exercise, such as weight lifting. But distance runners slow their pace by 2 percent for each percent of body weight lost through dehydration. Sweat loss of more than 10 percent body weight is life threatening. 13. Water can reduce constipation and help with urinary tract infections. There is also no scientific validation of theories that excessive water intake will improve weight loss, remove toxins, or improve skin tone. 14. You don't need eight glasses of water per day. No scientific evidence supports the "eight glasses per day" rule, so you can simply drink in response to thirst. You can also monitor the volume of your urine. If your urine is scanty, dark, and smelly, you should drink more. If you have not urinated during your work or school day (8 a.m. to 3 p.m.), you are severely under-hydrated. 15. Bottled water is not always better than tap water. According to the Center for Science in the Public Interest, nearly half of bottled waters come from municipal water supplies—not from the mountain streams pictured on the labels. This suggests standard municipal tap water is high quality. Rather than spend money on bottled water, turn on your tap. This will help stop the flood of 95 million plastic water bottles that get discarded each day, of which only 20 percent get recycled. Drink plenty of water—but think "green." Proper hydration is critical for performance, especially in the summer when higher temperatures and humidity causes athletes to sweat more. When the body loses water, dehydration can set in and cause blood volume to decrease, which can cause muscle cramps, fatigue, dizziness and difficulty regulating body temperature. Even the most conscientious athlete can hurt their efforts to stay hydrated because of the food they eat. Here are a few dehydrating foods and beverages to avoid during the summer racing season. Sodium is necessary for maintaining fluid balance in the body. However, large amounts of sodium ingested through cured fish, meats or deli meats, soy sauce, fried foods and snack foods like popcorn or chips can leave you feeling thirsty. Always choose items with lower sodium when available. For instance, if you're out for sushi, try the low-sodium soy sauce. Don't forget to drink extra water when eating these foods too. Athletes have slightly higher protein needs than the average sedentary individual. Yet, there's no good mechanism to store protein in the body if consumption surpasses need. Often people who consume large quantities of protein, while restricting carbohydrates, end up with increased ketone levels. Ketones are then excreted through your urine, and if your body is excreting more urine than usual, you need extra water to supplement all that was lost. Alcoholic beverages are high in calories (7 kcal/gram) and can cause dehydration—two bad side effects for athletes during summer racing season. A general rule is to consume one glass of water or club soda between alcoholic beverages. It may calm your buzz, but your body will thank you the next day. Have you ever wondered why you need a tall glass of milk to wash down a delicious brownie? Foods with high levels of sugar impact fluid balance in the body. Sweet foods and drinks drive up our thirst mechanism because many of them contain sodium. Turn to water and foods with high water concentration like celery and watermelon to quench your thirst and your hunger. Caffeine is considered a diuretic. In some people, caffeine does not increase urinary excretion nor cause increased heart rate. However, for those who don't normally consume caffeine, having it during training or on race-day is a recipe for dehydration. Blend all ingredients in a high-speed blender, pour in your favorite glass, and garnish with mint leaves, lime and/or watermelon wedge. Enjoy! 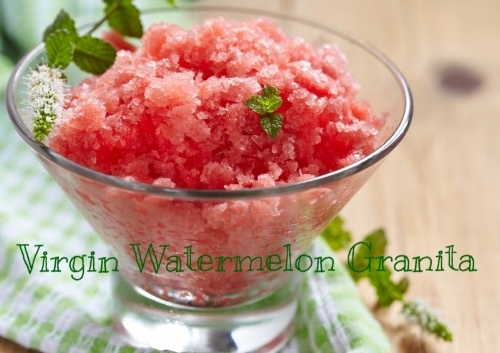 Note: True granitas take a bit more work. This is the quick + easy variation and tastes just as good. If you want an adult version, try adding in 2 tbsp of your favorite vodka. Cheers! Honey is one of my favorite "go-to" ingredients for all things skin related. It is right up there with coconut oil. Have a strange rash? Honey. Have a zit? Honey. Have a burn? Honey. Have dull, dehydrated skin? Honey. You get the picture! Be sure to get raw, unpasteurizedhoney. In a saucepan over medium heat, add the first three ingredients: raspberries, lemon juice, and honey. Mix together and let simmer. Once raspberries have broken down, bring heat to low to let thicken slightly. Whisk together pancake ingredients: eggs, almond milk, honey and vanilla extract in a large bowl. Then, while continuously whisking, add coconut flour, tapioca flour, baking powder and baking soda and a pinch of salt to the large bowl. Whisk until batter is well combined. Grease a large pan and place over medium heat. Once pan is hot, use a large ladle to pour a pancakes size pancake on the pan. Then use a small spoon to scoop out a tablespoon of the raspberry jam mixture and swirl it around on the top of the pancake. Once pancake has cooked and bubbles begin to surface on the top of the pancake, flip it. The pancake should need to cook for 2-3 minutes each side. Repeat with the rest of the pancake mixture. Thanks to PaleOMG for this tasty brekkie. 1. Bring all ingredients to (including chili peppers if using) to a boil. 2. Reduce to a simmer and let it cook for about an hour or so to really get those flavors melding. 3. Add in the mushrooms and coconut milk. Bring to a simmer. 4. Add in the chicken and simmer until chicken is cooked through. 5. Finish off with some cilantro and extra chili peppers (optional) and enjoy! Thank you to Paleo Comfort Foods for this yummy Paleo winter soup. Thank you to Elana's Pantry for this delicious Paleo recipe. Add dates into processor and process until a chunky paste forms. Add in the hemp, chia, sesame, cocoa, *coconut, vanilla, cinnamon, protein powder and salt. Process until thoroughly combined. Pulse in the cacao nibs. The dough should be sticky when pressed between your fingers. If it’s not sticky enough to shape into balls, add a small amount of water (a teaspoon at a time) and process until it comes together. Shape dough into small balls (about 16) and roll the top half of each in the remaining coconut flakes. Freeze for 20 minutes or so until firm. Store leftovers in the fridge until your next snack attack hits. Thank you to Oh She Glows for these sweet treats! Thoroughly scrub beets clean under cold water. Place beets in a large pot of water, and boil until fork tender (about 45 minutes). Remove skin from beets, then chop into bite-sized pieces. Allow to cool before adding to the salad. Rinse and chop the Fuji apple. 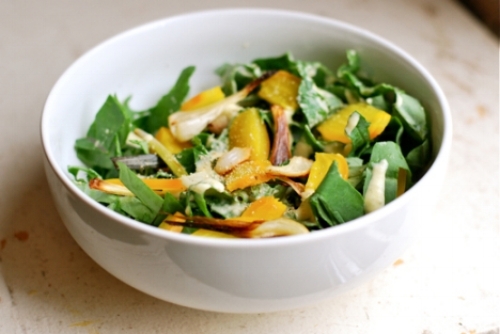 Toss spring mix greens with the apple and slivered almonds. Add in the cooked beet chunks. Drizzle salad with avocado oil and white balsamic vinegar, and serve. Thank you to The Food Lovers Kitchen for this perfect summer recipe.